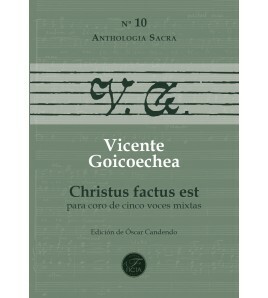 10th volume of the Anthologia Sacra by Vicente Goicoechea. Selected, edited and reviewed by Óscar Candendo Zabala. 3th volume of the Anthologia Sacra by Vicente Goicoechea. Selected, edited and reviewed by Óscar Candendo Zabala. 4th volume of the Anthologia Sacra by Vicente Goicoechea. Selected, edited and reviewed by Óscar Candendo Zabala. 26th volume of the Anthologia Sacra by Vicente Goicoechea. Selected, edited and reviewed by Óscar Candendo Zabala. 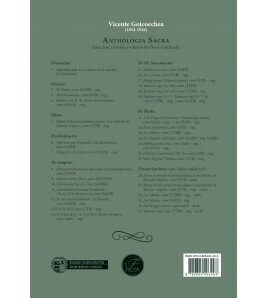 27th volume of the Anthologia Sacra by Vicente Goicoechea. Selected, edited and reviewed by Óscar Candendo Zabala. 2nd volume of the Anthologia Sacra by Vicente Goicoechea. Selected, edited and reviewed by Óscar Candendo Zabala.